Yes the silence has indeed been noticeable/deafening and for which we only have apologies to extend to everyone. There has however been no specific reason/s except for a bit of indecisiveness on our part for which we would once again like to record our regrets with you all. Hope and pray you all will condone this inadvertent lapse! Adeel Lari you are correct, the NED 69ers Golden Jubilee Celebrations will In Sha Allah be held in Karachi from Friday the 15th February 2019 to Sunday the 17th February 2019. Detailed programme covering the sequence of events and logistics will be intimated ASAP after necessary coordination, etc. You all may like to evolve and firm up your travel plans accordingly In Sha Allah. Take care and stay blessed you al 69ers!!! Finally the suspense is over and now all NED69ers can start getting their seats reserved for the said dates. We had a great dinner it was real delicious and enjoyed by all the attendees. 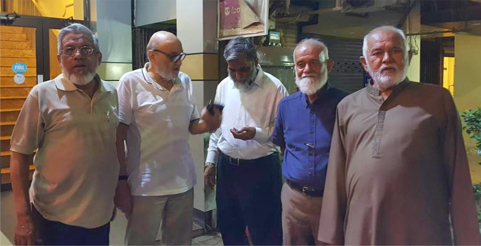 It was decided by all that NED69ers in Karachi will meet on the first Saturday on lunch of every month. The venue and other details will be communicated to all who wanted to attend. Engr. 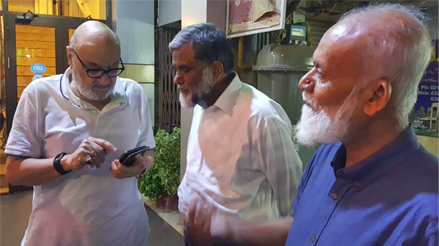 Abul Hassan Jafri is trying to get the latest cell number from Engr. Mahtab Khan, Engr. Mohammad Mahtab Khan, Engr. Shareef Ur Rehman Malik. We appreciated Engr. Mahtab Khan to inform about his arrival in Karachi and we all met. In future if any of NED69ers plan to visit Karachi he should do it in such a way that he can be a part of our monthly gathering of first Saturday of every month. Do contact any of the members you are in contact with. Finally we all wished Mahtab to have a safe journey back to Saudi Arabia and to always remember his all friends of NED69ers in his prayers whenever he visits the Holy Cities Makkah and Madina. We missed Engr. Muhammad Hamid in our group picture as he left early to attend a family party.